There are many people in this world who live only for themselves. They have no hunger for God or righteousness. They are lost. Let us not forget that each and every one of us was in that desperate camp at some time in our lives. Much is at stake as the end of days nears. Time is of the utmost essence. Christians know, deep within our souls, that the gospel has the power to change the hearts and minds of human beings, and knowing this, we should be wholly convicted to share it with the lost, no matter the cost to our comfortable and convenient lives. The charge is clear to those who call upon the name of Jesus. The call and commission is to take the gospel to the nations. Let us be clear: If we are not faithful to His call, souls will be eternally lost. What of those who have never heard of Jesus? What of those who died before Christ? The answers to these questions are a mystery. We live this life in Christ with mystery—we live by faith. The Scriptures tell us that one day we will know fully, even as we have been fully known. In the meantime, we do not have the luxury of theological speculation. Instead, we should assume that those who have never heard of Jesus will be eternally lost. Why? Because Jesus himself said so: “Jesus saith unto him, I am the way, the truth, and the life: no man cometh unto the Father, but by me” (John 14:6). “Go ye therefore, and teach all nations, baptizing them in the name of the Father, and of the Son, and of the Holy Ghost: Teaching them to observe all things whatsoever I have commanded you: and, lo, I am with you always,even unto the end of the world. Amen” (Matthew 28:19-20). “And he said unto them, It is not for you to know the times or the seasons, which the Father hath put in his own power. But ye shall receive power, after that the Holy Ghost is come upon you: and ye shall be witnesses unto me both in Jerusalem , and in all Judaea, and in Samaria , and unto the uttermost part of the earth” (Acts 1:7-8). In the year 1854, a 17-year-old boy was working in a shoe shop in Detroit. He didn’t know Christ and had no interest in matters of spirituality or religion. But, he had been forced to go to Sunday school, like a lot of kids these days. One day, his Sunday school teacher went to the shoe shop where this boy was working and said, “Hey, I’m worried about you. I want to talk.” So, they went into the basement of the shoe store, where the Sunday school teacher led the young man to Christ. The Sunday school teacher’s name was Edward Kimball, and the 17-year-old boy’s name was D. L. Moody. We now know that he went on to become one of the greatest evangelists in the world, and he shared the gospel with 100 million people. And this was in the age before modern technology. Pretty incredible! And of course, Moody also founded the Moody Bible Institute and Moody Memorial Church in Chicago. His name is well known in the Christian community, even today, more than a hundred years later. Now, it’s kind of cool to see that Moody went on to influence a man named F.B. Meyer, a London pastor and an intellectual who never focused on Jesus. Meyer’s congregation told him that they wanted this newly famous evangelist, Moody, to come speak to them. So, Meyer reluctantly agreed to let his congregation bring in Moody. Meyer, who had a lot of intellectual pride and was ashamed of the name of Jesus, invited Moody to do a revival in his church. When Moody showed up, Meyer immediately took a dislike to him. He didn’t like him because Moody was not well dressed, and because he only had a fifth grade education. Meyer had doctorates, and he was brilliant. So, he kind of looked down on Moody. But, Moody got up to preach in Meyer’s church and was anointed by the Holy Spirit. The power of God was upon him. And, as he spoke, he focused on Jesus, Jesus, Jesus. As such, hundreds upon hundreds of people came to faith in Jesus Christ that day from the pews of Meyer’s beloved church. Because of this, Meyer was embarrassed and consumed with jealousy. After the revival, Moody quietly left, leaving Meyer with his congregation and with his jealousy and anger. As he told the story, Meyer began to weep. The Holy Spirit broke through; he was convicted and supernaturally changed. For the rest of his life, he preached Jesus to all who would listen. As the years went by, Meyer influenced J. Wilbur Chapman; J. Wilbur Chapman influenced Billy Sunday; then Billy Sunday influenced Mordecai Ham. And it was Mordecai Ham who led Billy Graham to Christ. Get it? Spiritual dominoes. You see, it’s incredible, the power of the gospel. To think of Edward Kimball, D.L. Moody, F.B. Meyer, J. Wilbur Chapman, Billy Sunday, Mordecai Ham, and then Billy Graham, all in a row, one going to the next, and then the next, by the power of Christ, only serves to tell us that we need not fear. We should share the gospel with confidence and joy. 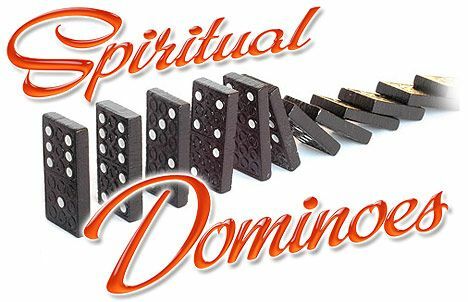 When we tell someone about Jesus, we have no way of knowing what the domino effect is going to be. In our lifetime, we may not even be aware of the full harvest of souls brought to the kingdom of God simply because we remain faithful to the call. So, please be faithful. So they were just clowning around when they went into that tent. Once inside, they realized that there was no room for them; they couldn’t find any seats. So Billy said to his buddy, “Let’s get out of here.” As they turned to leave, an usher standing there saw them and said, “Hey, guys.” He put his big arms around their shoulders and said, “You know, hey, welcome. We’re so glad you’re here. Let me take you to a seat.” So, the usher took them to a seat and the rest is history. Billy Graham found Jesus that night, and he went on to take Jesus to the world. That usher could never have known how God was using him that night through his simple yet faithful service. So, serve Christ, knowing that it might be a mystery–what God is doing through you. It’s incredible. God is great. The power of God attends the grace of the Gospel. So, be faithful to your call and commission. In closing, one more little short story about Robert Moffat, who was called Bobby in his youth. It was 1807, when Bobby was just 12. He was inScotland, at church, and that Sunday morning, a strange thing happened. After the offering, little Bobby Moffat stepped into the offering plate. He stepped right into it! Of course, when one of the church ushers saw this, he yelled, “Boy! What do you think you’re doing?” Bobby replied, “I’m giving my whole self to Jesus!” That’s what this 12-year-old boy said to that usher. Eight years later, when Bobby (now called Robert) was 20 years old, he was accepted by the London Missionary Society to be a missionary to Africa. The next year, in 1816, Robert Moffat turned 21 and headed down to Cape Town,Africa, where he met his wife, Mary Smith. For more than 50 years, Robert and Mary Moffat partnered to serve Jesus Christ together on this earth. At the time they met and married in Cape Town, Africa, no one went north of Cape Town because the region 100 miles north of Cape Town was known as “the dark continent.” But Robert and Mary Moffat went. They went into Botswana, where they became missionaries. They took Jesus to those people, the Swana people. The Swana people had driven the “sand people” into the Kalahari. Driven from their land, they became bushmen. Robert Moffat ministered to both the bushmen and the Swana people, telling them about Jesus. He translated the whole of the Old and New Testaments into the language of those people. Then he took Christian classics, like Pilgrim’s Progress, and translated them so that the people could read these great works, and he led the people to Jesus. He was disappointed that night because no one accepted his invitation. But, what he didn’t know was that a young man there was convicted by the Holy Spirit that night. The young man was David Livingston, who went on to marry Robert and Mary’s daughter–an incredible tale of its own! Afterwards, David Livingston went to Africa, leading thousands of people to Christ. In Glasgow, he had received his medical doctorate and a degree in theology. He went to Africa as an explorer, looking for the headwaters of the Nile River. He went as a civil rights leader, fighting the slave trade. He went as a missionary and an evangelist, taking Jesus to the people, faithful through his years. Isn’t that what it’s all about? Stepping into the offering plate? Dedicating the whole of our lives to Christ? We have a message that the world needs. We have a Savior. We have Jesus. Let us be faithful in this hour and share the grace and mercy of Jesus to all of those who will hear. Let us fight against the flow of damnation for souls who have yet to hear. Source: From the sermon of Dr. Jim Dixon, “Sin and Salvation.” Cherry HillsCommunity Church , Highlands Ranch, Colorado . January 27, 2008.